“What 1997 was to Internet and browsers, 2017 is to bots.” — Dharmesh Shah, HubSpot founder and CTO. Indeed, AI chatbots are already used in a number of everyday activities. You have probably encountered chatbots while ordering flowers online, scheduling a meeting or finding a suitable mortgage plan. 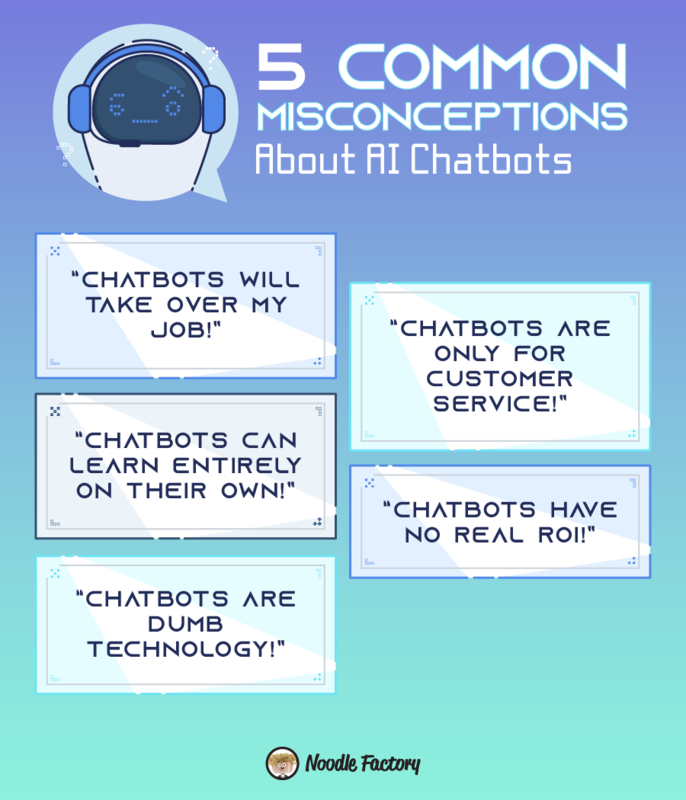 While the benefits of chatbots are clear, there are certain misconceptions about what chatbots are exactly and what they can do. Here, we debunk 5 common misconceptions about AI chatbots. Research firm Gartner predicts that by 2020, 85% of questions will be answered by virtual assistants. Some businesses have started implementing chatbots to replace humans in customer service roles. While chatbots can handle repetitive and simple questions and tasks, humans are still required to answer complex issues and questions when chatbots are unable to give satisfying replies. For instance, chatbots can help in simple requests such as resetting passwords and users need not wait for a few business days to get this done. But complex issues regarding feedback about defects in the purchased product may require a live human agent to intervene and decide on the best course of action for such situations. Chatbots can complement human teams when it comes to speed and convenience for customers. Chatbots can be trained to respond to customer questions and provide fast solutions 24/7, resulting in higher engagement for businesses. And with basic questions handled by chatbots, your team is freed up to manage complicated and complex issues. This will free humans up from drudgery and lead them to focus on more important and creative tasks. Want to schedule meetings, book your next holiday or find true love? There are chatbots for those. The more common uses of chatbot are in customer service where chatbots answer simple questions such as product enquiries or opening hours of the store. However, chatbots can be customised to serve different industries. For instance, chatbots are being explored in the field of education where they can act as virtual tutors for students, conduct practice sessions and create custom learning experiences for students. While AI is an advanced form of technology, just like any software, it still requires human intervention. Think of AI as your rocket and data is the fuel that powers it. Machine learning requires huge amounts of data that very few organisations possess and even fewer have the capability to apply it in machine training. A subset of machine learning is supervised learning and this is where humans are required to provide the basis for decisions. For example, an AI system might be provided with labelled pictures of cats and dogs. After some time, the system should be able to identify and categorise unlabelled images, at which time the training will be deemed to be completed. Failures such as Microsoft’s Tay.ai make chatbot limitations obvious too. While they learn from users, it has no way of filtering out the good from the bad, so humans still have a role to play in facilitating the interactions between chatbot and users. Being a new technology, many people who has had conversations with chatbots regard it as something that is “nice to have, but not necessary” for their business. They believe that chatbots are still in the experimental stage and has not considered any long-term strategy for chatbots implementation. Research has found that approximately 45% of end users prefer chatbots as the primary mode of communication for customer service enquiries. Chatbots provide round the clock customer service, while reducing manpower and operational costs. This is why retailers are using AI to optimise the shopping experience, loyalty programs, merchandising and supply chain while managing inventory and costs. In fact, it is projected that by 2023, the use of chatbots will bring $11 billion in combined cost savings for banking, healthcare and retail sectors as a result of replacing customer service representations. “I’m sorry I didn’t get your point, try typing again” or “Please select from the options above”. These are some of the deadlocks we encounter while chatting to chatbots at some point or other. Chatbots have their limitations and not all chatbots uses natural language processing. Even if they do, human language is complex (think sarcasm and tone of language) so it is tough to expect computers to communicate with us at the same level. But in the same way that we can train artificial intelligence to work with surgeons in the operating theatre or grade hundreds of student essays, it is possible to train chatbots to be efficient at what you want them to do. Technology will progress as humans continue to test and create better chatbots beyond simple question-and-answer scenarios.